What Day Of The Week Is July 7? 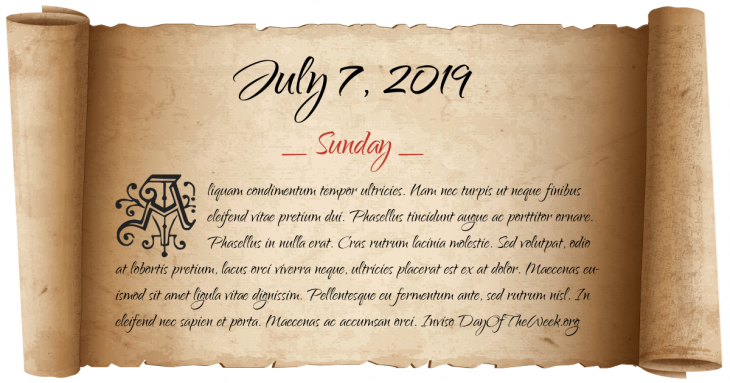 July 7, 2019 is the 188th day of the year 2019 in the Gregorian calendar. There are 177 days remaining until the end of the year. The day of the week is Sunday. The terms 7th July, July 7th, and 7/7 (pronounced “Seven-seven”) have been widely used in the Western media as a shorthand for the 7 July 2005 bombings on London’s transport system. In China, this term is used to denote the Battle of Lugou Bridge started on July 7, 1937, marking the beginning of the Second Sino-Japanese War. Napoleonic Wars: the Peace of Tilsit between France, Prussia and Russia ends the Fourth Coalition. Katipunan: the Revolutionary Philippine Brotherhood is established, contributing to the fall of the Spanish Empire in Asia. An International Railway trolley with an extreme overload of 157 passengers crashes near Queenston, Ontario, killing 15. Sino-Japanese War: Battle of Lugou Bridge – Japanese forces invade Beijing, China. World War II: Largest Banzai charge of the Pacific War at the Battle of Saipan. Howard Hughes nearly dies when his XF-11 spy plane prototype crashes in a Beverly Hills neighborhood. U.S. President Ronald Reagan appoints Sandra Day O'Connor to become the first female member of the Supreme Court of the United States. Who were born on July 7?